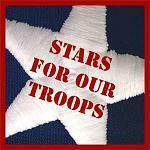 created by Stars for our Troops Inc.
Are Serving by repurposing Stars from retired American Flags, enclosing in a small pouch with a Thank You note and giving to our soldiers and veterans. We have included our first responders to receive Stars. They are our team at home that do so much for us every day. "I am part of our American flag that has flown over the U.S.A. I can no longer fly. The sun and winds have caused me to become tattered and torn. Please carry me as a reminder that You are not forgotten." We show support to those that have Served and those that Are Serving by repurposing Stars from retired American Flags, enclosing in a small pouch with a Thank You note and giving to our soldiers and veterans. We have included our first responders to receive Stars. They are our team at home that do so much for us every day. The note says: "I am part of our American flag that has flown over the U.S.A. I can no longer fly. The sun and winds have caused me to become tattered and torn. Please carry me as a reminder that You are not forgotten."